A fave of athletes, influencers and musicians, Peace Collective is making its mark on the world in a very big way. Philanthropic streetwear brand Peace Collective is well aware of the magic in moments. Moments like Jose Bautista choosing to Instagram a shot of himself with Josh Donaldson and David Price in the brand’s now infamous Toronto vs. Everybody sweatshirt during the playoffs. Moments like Bautista asking fans to follow @PeaceCollective and get their own sweats to support Breakfast for Learning (an organization working to eliminate child hunger in Canada), which generated $15,000 in sales and put this homegrown design team firmly on the map. A little bit of luck and a lot of hard work infused with an underlying desire to make a difference in the world seems to have brought the Toronto-based brand a lot of recognition and loyalty just over one year into the business. With a home line in the works, a kids line in collaboration with Mini Mioche on the way, as well as a collab with Mendocino and a Canadian Influencer’s video project to come, it looks like Peace Collective are positioned to succeed at anything they put their minds to. Success like this doesn’t happen everyday, and there is clearly something special about this team of twenty-something go-getters. Not only are they connecting with the Canadian population in an authentic and stylish way, but founder Yanal Dhailieh also seems to have found the secret to living your best life: 1) Do what you love and 2) Add value to the world. After some shirts he designed for himself and his friends to show support at a Raptors game caught the attention of fans and a TSN crew, Dhailieh saw the opportunity to create a business that would allow him to put his best life principles into play. A friend at Lululemon invited him to create a small collection of shirts for their Queen Street store, and when the collection sold out, he was commissioned to create shirts for all the stores in the GTA, which sold out again. He followed up with the "Home is Here" capsule collection for Lululemon stores across the country, and the response was the same: no one could keep the shirts in stock. Canadians loved Peace Collective’s in-your-face patriotic pride, and they were clamouring to show it. And as sales grew, so did the brand’s charitable donations. From its inception, Peace Collective was created to give back. On a trip to Morocco, Dhailieh discovered programs designed to feed hungry children, giving them the opportunity to stay in school instead of begging for money on the streets. The importance of feeding malnourished children so that they, too, could succeed in life stuck with him, which led him to form an alliance with Breakfast for Learning. Now, Peace Collective donates $4 to the organization for every garment purchased. 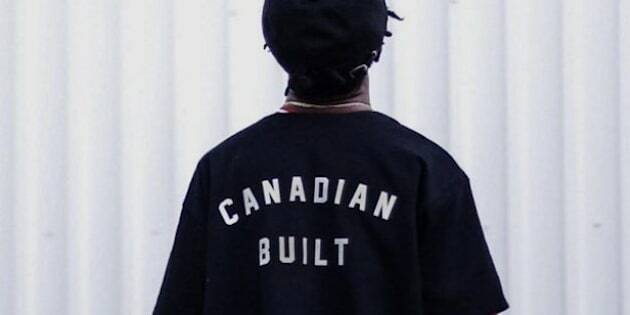 #homeiscanada All reppin' one thing. With the growth of his brand, Dhailieh has plans for to create a specific Peace Collective charity and establish their own community movement. His iconic sweatshirts, toques, tees, tanks and jackets are showing up in influencer Instagram feeds, on athletes, models and in the windows of trendy boutiques. But Peace Collective is so much more than a passing fad — rooted in minimalism, simplicity, and an admirable philanthropic sensibility, this brand is here to stay. In a world where there are so many imbalances and injustices, Peace Collective serves as an inspiration to make social responsibility a priority, while still operating a viable business. Turning a profit as a legitimate player in the fashion industry and giving back does not have to be mutually exclusive, and Dhailieh is proudly proving that the two go hand in hand. The homie @therealcabbie rocking his Canadian Built tee with @kobebryant for the NBA All-Star game. Embracing multiculturalism, individual style and strong sense of community, the brand stands out as being truly, authentically Canadian. Peace Collective is for everyone who cares enough to make a difference, to be part of something bigger. And in Dhailieh’s best-selling words, Peace Collective is Canadian as F*$k.